We believe that your wedding, your engagement, your party, your function – is special. So we think it’s important that the catering we provide is just as special. 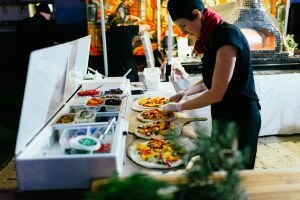 We pride ourselves in the fact that we are the only mobile wood fired pizza catering business here on the Sunshine Coast, that make & stretch our own dough and completely create our own fresh ingredients (smallgoods excluded). We have catering, chefing (Aleta) and gourmet butchery (Allan) backgrounds. We only make food, that we would eat ourselves. The meats we buy in locally. From QLD producers. Gluten free and low additives. The seafood is from QLD, Australian & NZ fisheries. The Real sauces, marinades and Fresh dough bases – we make ourselves. The veg & fruit we buy from local producers, local grocers, Yandina & Noosa Farmers market. Wow! Allan and Aleta and staff thank you! I didn’t get a chance to speak to you on the wedding day and thank you properly for such wonderful food and service! Thank you for keeping our 110 guests full and satisfied with beautiful fresh pizza! I heard nothing but praise from everyone for you guys! You set up everything yourselves and are very self sufficient! Thank you for making my job easy when organising prior to our big day, you truly are professionals! Thank you! A wonderful experience…wonderful service, well-priced, great communication in the event lead up from Allan and Aleta, and most importantly, delicious pizza! Pizza Fusion proved an excellent catering choice for an at-home 21st birthday and I wouldn’t hesitate to recommend them to anyone! Pizza Fusion was just great. You catered for my daughters wedding on the 12th August & they were delicious, I’ve been raving about them to everyone. You have made the best pizzas that Kayla and I have ever had. Allan and Aleta you are both amazing. Thanks for your amazing service at our wedding. Allan and Aleta catered for Engagement Party last night. Fantastic service!!! Amazing pizzas with professional service. Absolutely no stress !!!!! Thanks guys – highly recommend. Pizza Fusion catered our wedding in October! Allan and Aleta make truly amazing pizza with all local ingredients and are very accommodating with creating a menu to meet a wide range of dietary requirements! Alan and Aleta are very friendly and extremely enthusiastic to cater for all your needs. The team went above and beyond at our wedding to create an evening to remember for over a hundred guests! Thank you once again guys! Thank you Allan and Aleta for catering our wedding! The Pizza was amazing and the guests couldn’t get enough of it! We highly recommend Pizza Fusion, their pizzas were incredible and their setup was very professional and restaurant like. Very smooth service and extremely friendly staff! Thank you Allan and Aleta! 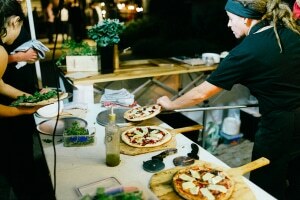 We had Pizza Fusion Sunshine Coast cater our wedding in April 2016 and were extremely happy with everything! All of our guests commented on how good the food was and also how lovely the staff were. Will recommend to others! Thank you to Pizza Fusion for catering our daughter’s 21st Birthday Party on our tennis court everyone loved the amazing pizzas & your selections are scrumptious . As we have no catering facilities near the tennis court Pizza Fusion was a great and practical catering option. We would not hesitate to recommend Pizza Fusion to anyone. Seriously one of the best pizzas I’ve ever had. Amazing crust with great flavour combination. Also such nice people catering, so relaxed, enthusiastic and happy. It’s a great vibe! – a Friday night must. My mouth starts watering as I travel along the Noosa-Eumundi Road just thinking about Pizza Fusions beautiful Pizzas. I just wanted to say a HUGE thank you for last weekends pizza. Everyone raved about the food and you couldn’t have made it any easier for me. You guys are fantastic and I will be recommending you to all of our friends. Aleta and Allan catered our wedding last night. In the lead up they were amazing in handling all of my questions and organising all the nitty gritty details with me. On the night they arrived on time and began serving earlier than planned on our request due to our earlier running times which fit in perfectly. The pizzas were amazing. I myself am gluten free and they easily delivered my pizzas to my table for me so I was able to eat all night without trouble. We are currently driving home with leftover pizzas on my lap and to my surprise, two gluten free pizzas included for me too which I am very much looking forward to enjoying again. Thank you for all your help and delicious pizzas! Pizza Fusion catered our wedding in November! Amazing pizza, all local ingredients & friendly service! Over 100 very happy guests enjoyed some really awesome fresh pizza. My pick is the La Carné Pizza – a truly amazing slice! Beautiful thin bases and fresh local ingredients…. Friday night favourite! Allan and Aleta just catered for our sons 21st. The service both before and on the night of the event was very professional and friendly. There was a great selection of Pizza’s to choose from and they were amazing and just kept coming. The Gluten free Pizza’s were great too. Everything was cleaned up and left better than when they arrived. It was just fantastic, would thoroughly recommend Pizza Fusion. We cannot express how much we appreciated everything you did. The service and food was AMAZING! From the months before to the day! I think Pizza Fusion have the best pizzas ever and the staff are so beautiful! We create an atmosphere & culinary experience that is unique, intimate and exceptionally memorable. There’s something about great food and a good-looking fire that entices people to relax, laugh and mingle. Delicious Wood-fired Gourmet Pizza & more. Fresh, locally sourced, hand selected ingredients. Our gourmet pizza catering can be molded to fit your formal or casual occasion, AND your budget..